As anyone who has ever consumed bacteria-contaminated food and experienced "food poisoning" can tell you, it's a miserable experience. Yet it's an all-too-common one, with foodborne illnesses making 1 in 6 Americans—or 48 million people—sick each year. Of these people sickened, 128,000 end up in the hospital, according to the Centers for Disease Control and Prevention, while 3,000 die. Foodborne illnesses spread easily and, as such, are a difficult-to-control problem—even more so in developing nations. This means that quick detection can play a critical role in halting the spread of contamination. Traditional detection methods, however, tend to be haltingly slow. Recognizing the need for a real-time biosensing system to detect pathogenic bacteria, such as Salmonella, a team of Auburn University researchers came up with a novel design, which they describe in the American Institute of Physics' Journal of Applied Physics. 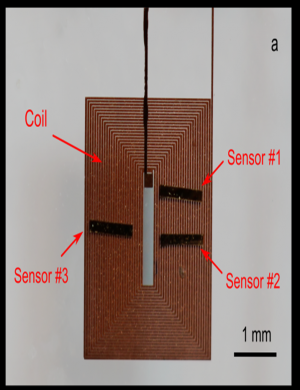 What sets this biosensing system apart from traditional detection methods is a design that involves using a magnetoelastic biosensor—a low-cost, wireless acoustic wave sensor platform—combined with a surface-scanning coil detector. The biosensors are coated with a bacteria-specific recognition layer containing particles of "phage," a virus that naturally recognizes bacteria, so that it's capable of detecting specific types of pathogenic bacteria. Traditional technologies required the sensor to be inside a coil to measure the sensor's signals, said Yating Chai, a doctoral student in Auburn University's materials engineering program. "The key to our discovery is that measurement of biosensors can now be made 'outside the coil' by using a specially designed microfabricated reading device," he explained. "In the past, if we were trying to detect whether or not a watermelon was contaminated with Salmonella on the outside of its surface, the sensors would be placed on the watermelon, and then passed through a large coil surrounding it to read the sensors," Chai says. By stark contrast, the new biosensing system is a handheld device that can be passed over food to determine if its surface is contaminated. "Now, tests can be carried out in agricultural fields or processing plants in real time—enabling both the food and processing plant equipment and all surfaces to be tested for contamination," notes Chai.